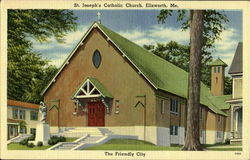 Ellsworth, Maine, was visited by missionary priests for many years before Catholics of the town enjoyed the ministrations of a resident pastor. Rev. James C. Moore, S.J., (1848-1853) was the first pastor who fixed his residence here in 1848. Father Moore remained for about six years, and was succeeded by Rev. John Bapst, S.J., of sainted memory, who continued in the pastorate two years. Fr. John Bapst, (1853-1854) one of the earliest pastors of St. Joseph, Ellsworth, “… arrived in New York in 1848 and, though ignorant of both English and Indian, was sent to minister to the Indians at Old Town, Maine. He arrived on Aug. 7, 1848, with no knowledge of English, the Ponobscot language, or their customs. As a testament to his character and determination, Father Bapst was able to overcome these deficiencies within a few short months, and soon became an integral part of the community. The inhabitants received him with every demonstration of joy, but he found them in a very degraded moral condition. They had been without a priest for twenty years, and he laboured zealously for their reformation. He founded several temperance societies in Maine. In 1850 he left Old Town for Eastport. His work immediately began to attract attention, both for its results among Catholics and the number of converts who were brought into the Church. As his missions covered a large extent of territory, he became generally known through the State. In 1853, Father Bapst visited the community in Ellsworth and delivered a series of lectures on the Catholic Church. In doing so, he made several converts in the community, but also aggravated the Know-Nothing elements of the community, which "denounced (him) from the pulpit and in the press. (And) he was warned that he would suffer injury if he did not stop." In October of the same year, another incident occurred which increased the friction between these groups. The local school teacher declared that all students were required to read the Protestant Bible in school or they would not be able to attend. This policy was approved by the local school committee, and after two students were expelled, Father Bapst and his parishioners petitioned the committee to reconsider. The committee stood by its decision, and, undeterred, Father Bapst decided to form a school for his parishioners. By 1854, when the Know-Nothing excitement broke out he was at Ellsworth. Besides being disliked as a Catholic priest, he was particularly obnoxious because of his efforts to establish a Catholic school there. On October 14, 1854 a mob appeared outside the home of a local family he was staying with, and demanded he come out to meet them. Hoping to avoid any harm coming to the family or their home, he gave himself up to the crowd, and was taken to the Ellsworth Machine Company where he was stripped, tarred, and feathered. He was then carried on a rail through the streets and left unconscious at Tisdale's Wharf. It is believed to be the only time in American history that a Catholic priest was assaulted in such a way. Luckily, Fr. Bapst was not killed in the brutal attack. Upon regaining consciousness, he was met by a group of Catholic men who had set out to find him, and brought back to the home from which he was taken to recover. Despite this brutal episode, under guard of armed local Catholics he still said Mass Sunday morning, and again the next day, before returning to Bangor by carriage. The incident was investigated by the State Attorney General, but none of the offenders were prosecuted. Four years later he was assigned to Boston where he oversaw the construction of Boston College and served as its first president. The library there is named for him, as is the former Catholic high school in Bangor. Early Pastors: Note: All of these early dates are approximations based on the history which says, "served for x years." Rev. John Coffey, (1865-1872) remained in Ellsworth during seven years. Given charge of the mission in Bar Harbor he began construction of St. Sylvia's, which was ultimately replaced by Holy Redeemer. One Special Priest: Of particular note in the history of priests who have served St. Joseph Ellsworth, Rev Fr. Richard B MacDonough, S.S. deserves special note. For 50 years from 1964 through 2014, Fr. MacDonough came to Ellsworth (most recently from California) where he was reunited with his 1964 Volkswagen Beetle to serve the parish during the summer, which facilitated the opening of three mission churches in Blue Hill, Winter Harbor and Green Lake. Rev. Conrad L’Heureux (??? ?-1978) remained until he was sent to Yarmouth in 1978. (Note from Connie Babcock) The information from Fr.Anciaux through Fr. L’Heureux came from a diary maintained by two of my great-aunts, Frances Hurley Duffy and Margaret Hurley Doherty. They and their sister, Annie Hurley, were always very active in the parish, and made notations of such things as arriving and departing priests, proceeds from church suppers, when they had flowers for the altar from their garden, all sorts of small things which were the stuff of life for people born in the Nineteenth century. Rev. Scott Mower (Summer 2004-July 2014) conducted a Capital Campaign and oversaw the replacement of the steps at the front of the church on High Street. Rev. John Skehan (October 2014-June 2018) Became Pastor of our Cluster (11), which made him Pastor of St. Joseph's. Conducted a Capital Campaign and oversaw the reconstruction of the parking lot, with a plan to replace the roof and upgrade the maintenance of the cemetery. Rev. Joseph Cahill, (June 2015-present) Parochial Vicar. Rev. Emile Dube, (July 2018-Present) Pastor of our Cluster (11), which made him Pastor of St. Joseph's. The first Catholic Church in Ellsworth, located on High Street was built in 1853. That church was burned during an anti-Catholic rally in April 1856. In 1862, a church was built on Chapel Street off Bridge Hill. McShane Foundry in Baltimore, Md., made a bell for the church in 1884. The bell was placed in the church tower in 1887, according to a history of Ellsworth written by Albert H. Davis. The bell is inscribed in Latin Sancte Joseph Ora Pro Nobis - St. Joseph Pray for Us. It was moved to the current building when that was built in 1939. In 1939, the current church at the intersection of Main Street and High Street was constructed. Byrne, William, and William Augustine Leahy. History of the Catholic Church in the New England States. Boston: Hurd & Everts, 1899. Print. Campbell, Thomas. "John Bapst." The Catholic Encyclopedia. Vol. 2. New York: Robert Appleton Company, 1907. 5 Jun. 2010 <http://www.newadvent.org/cathen/02258a.htm>.